1] The Laxmi Yantra should be prepared in the likeliness of the one shown in the image given below. The Yantra need not be the exact replica of the image, which is only given as a guideline. 2] The Yantra should be made on any auspicious Tithi, Shubh Muhurat or Yoga or any Hindu Festival. It should be prepared on a Bhojpatra using Ashtagandha Paste using a Anar Kalam[pointed wooden stick of a pomegranate tree]. While preparing the Yantra, the practitioner should wear yellow colored clothes. 3] Then, it should be placed in a copper plate and placed in the western direction of the house. 4] Then, the Yantra should be worshiped and offered white colored flowers and Dhoop and a Pure Ghee Diya should be lit in-front of it. 5] Then the practitioner should sit down before the Yantra and chant the Beej Mantra – प्रीं प्रीं प्रीं प्रीं - Preem Preem Preem Preem, 1000 times. 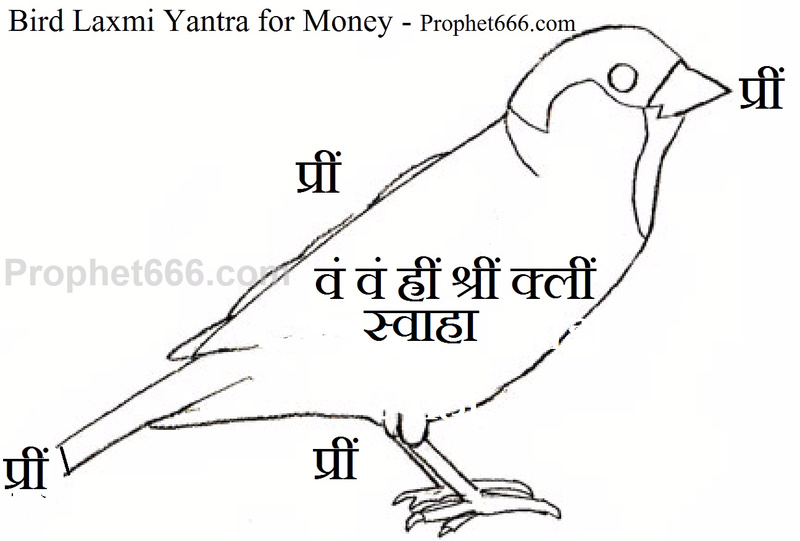 6] Then, the Yantra should be offered a Prasad of Kheer. 7] Finally, the practitioner should perform a Havan and chant the Beej Mantra - वं वं ह्रीं श्रीं क्लीं स्वाहा - Vam Vam Hreem Shreem Kleem Swaha, 108 times, while making the offerings to the Havan. The practitioner can use any recommended Laxmi Havan Samagri and offering. 8] Performing the above mentioned Laxmi Yantra Prayog for 108 days is said to make the Yantra Siddh and most powerful. After the completion of the 108 days of Laxmi Yantra Prayog, the practitioner should put the Yantra in a gold or silver locket and wear it around his right upper arm. This Chidiya Roopi Lakshmi Yantra Experiment is said to make the practitioner prosperous, wealthy and never short of money or luxuries. Yes, ladies must take a break during the monthly cycle. CAN WE PRINT THIS YANTRA? i AM UNABLE TO PRINT. Surya dev is the king of Navgrahas. 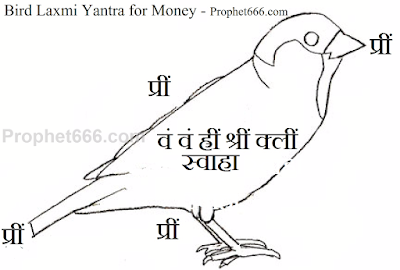 Shani dev and Yama dev are his sons. Surya is associated with fame, will power, success, authority and kingship. Because of these qualities Surya is considered a very important planet in the Vedic astrology. It is said that those who have a strong Surya will be highly successful in life. Hope this gives some perspective.